This project is now completed and has a ResearchGate summary page that includes publication links. In this project, we will a) conduct a multi-decadal three-dimensional hindcast of Long Island Sound (LIS) to study hypothesized linkages between the Sound’s physical climate and its recent ecological response and b) project future impacts of climate change and variability on the LIS ecosystem and its living marine resources over the span of the 21st century through model development and synthesis. 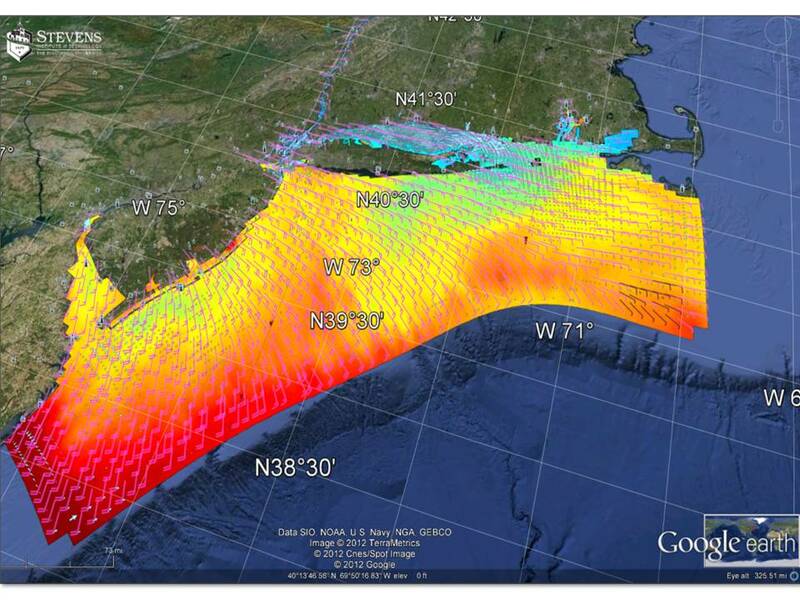 Figure 1: NYHOPS 3D model domain showing simulated SST, surface currents, and wind barbs. From the Google Earth viewer of the NYHOPS operational forecasts. 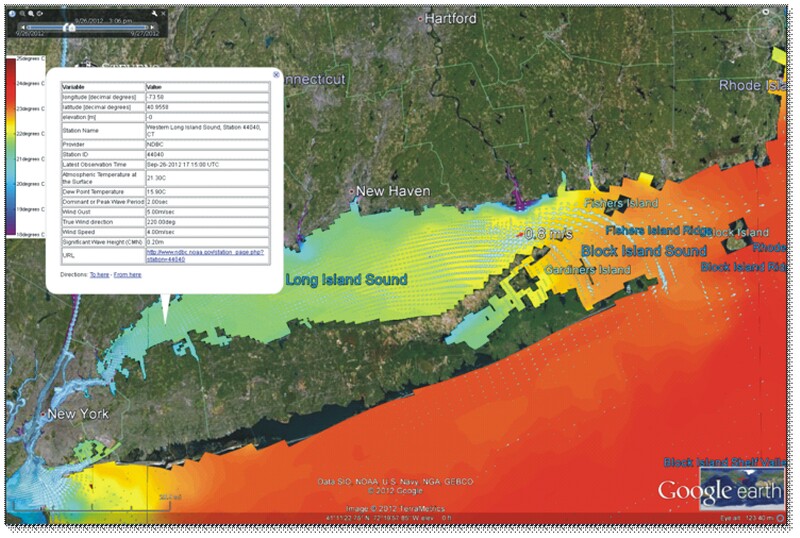 Address the paucity of physical environmental data during Long Island Sound’s (LIS) observed warming trend and accompanying fisheries shift since the 1970s by running a hindcast of the LIS circulation using the New York Harbor Observing and Prediction System (NYHOPS), an operational, comprehensive, high-resolution, three-dimensional, numerical model (Figures 1-2). Project the impacts of climate change and variability on the Sound’s ecosystem and its living marine resources until the year 2100, by forcing NYHOPS with Intergovernmental Panel for Climate Change (IPCC)-class global climate models, creating NYHOPS-based predictions for LIS to the end of this century, and deducing future changes to the LIS ecological regimes. Figure 2. A zoom of the NYHOPS domain that covers the Long Island Sound. Shown is simulated SST (colored background and legend on the upper left), a popup with data from a UCONN buoy used in the NYHOPS model, and instantaneous surface current vectors also from the NYHOPS model. Screenshot taken from the NYHOPS google earth viewer 9/26/2012 1900Z. Over the last few decades, the LIS ecosystem has undergone profound changes. Water temperature measurements at a LIS long-term station frequently used in ecosystem assessments (LISS 2010, Howell and Auster 2012, among others) have recorded a significant warming trend (1.46ºC increase from 1976 to 2010; Dominion Resources Services 2011). Concurrently, substantial changes have occurred in the community structure and abundance of living marine resources in LIS (Howell et al 2005; Howell and Auster 2012). A dramatic example is the American lobster (Homarus Americanus) collapse, initiated by the major die-off in 1999. Although multiple factors may have been synergistically responsible for this collapse, the increase in bottom temperature was likely the major factor that caused an increase in the mortality rate of lobsters, especially egg-bearing females (Howell et al 2005). Interestingly, the lobster collapse was exclusive to southern New England waters south of Cape Cod. The lobster stocks and fisheries further north, particularly the Gulf of Maine, are thriving. Reported landings have been at record highs over the past decade (Thunberg 2007). Based on the CT DEEP trawl survey, there seems to have been a shift in adult lobster population (ALTC 2010), that has altered the area where young lobsters recruit (Kim McKown, pers. comm.). Fisheries-independent trawl surveys in LIS have reported substantial changes in finfish community structure and abundance (Howell and Auster 2012). Correlated with the increase in the bottom temperature of LIS from 1984 to 2008, the seasonal mean catch of cold-adapted finfish [i.e. windowpane flounder (Scophthalmus aquosus), spotted hake (Urophycis regia)] has significantly decreased, while warm-adapted species [i.e. butterfish (Peprilus triacanthus), striped sea robin (Prionotus evolans)] have increased (Howell and Auster 2012). There appears to have been a cold to warm species regime shift in the 95 finfish species examined statistically separating the community seen in 1984-1998 compared to 1999-2008 (Howell and Auster 2012). Although this time-period may be too short to attribute to climate change, it is apparent that the ecosystem of LIS may have responded to a climate perturbation. The aforementioned reports suggest a regime shift in both the climate and ecosystem of LIS occurring around 1998. Remarkably, there have been increasingly more studies reporting a 1998 regime shift in the climate and living marine resources of coastal and pelagic marine ecosystems in vastly different parts of the world. To name a few, these include the Bering Sea (Rodionov and Overland 2005), the North Pacific (Overland et al 2008), and the North Sea (Weijerman et al 2005). Therefore, there may be a large-scale climate teleconnection between the local LIS climate and the global climate, whether due to natural or anthropogenic climate perturbations. The apparent sensitivity of LIS to climate warrants research that elucidates the specific processes that are associated with the ecosystem’s response to climate perturbations. This is especially critical for projecting the impacts of global climate change on the LIS ecosystem given the 2-3ºC increase in surface air temperature projected by climate models included in the IPCC fourth assessment report (Christensen et al 2007). In order to assess, understand, and project the biophysical and mechanistic underpinnings between climate and living marine resources of LIS, a detailed, historical analysis of climate and living marine resources is first required. However, the historical three-dimensional physical data of LIS is very sparse and only provides a general warming trend based on a few stations (one of which is near a power plant) without details on the relationships between circulation, hydrology, high-resolution depth-profile data covering the entire area of LIS, and interaction with the shelf-waters outside of LIS. Our proposed research will attempt to fill in these gaps.